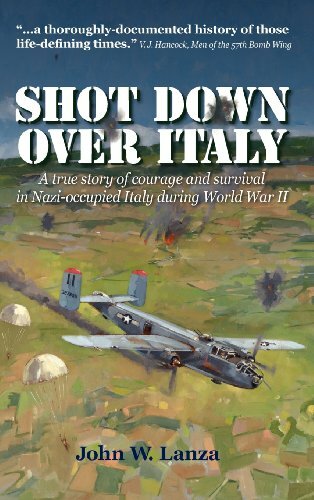 On May 26, 1944, a B-25 Mitchell bomber with a seven-man crew was shot down over Nazi-occupied Italy. At the time, Italy was a battleground in a bloody war of attrition. This crew trained long and hard to prepare for combat, but nothing prepared them for evading the enemy, surviving a prisoner of war camp, or worse still, death. Little was known about the experiences of each crew member after the plane was shot down, even by their families, because evaders have to certify in writing that they will remain silent, prisoners of war choose to remain silent about their hellholes, and the war dead can't tell tales. This all changed in 2006 when the nephew of one of the crew members became curious upon learning that his uncle and another crew member survived the war thanks to the courage of his pilot and two Italian partisans and their families. During the ensuing four years, the author bonded with his uncle, visited the two Italian families, and connected with the only other surviving crew member as well as the families and friends of the deceased crew members. Along the way, he pieced together a captivating true story with many fascinating aspects, including a pilot who put his crew's safety above his own, airmen who trusted partisans with their lives, partisans who risked their lives to honor this trust, airmen who as prisoners of war survived inhumane conditions, and families who struggled to deal with the cruel realities of war.